Since 2010, gal pals all over the U.S. have been getting together once a year on February 13 to celebrate Galentine’s Day, which became an official holiday when “Parks and Recreation’s” very own Leslie Knope declared it an unofficial day to celebrate female friendships. Come visit these top 10 places in Indiana to have the best Galetine’s Day ever! As Leslie Knope once said, waffles are an important part of life. Come to the Kokomo-Howard County Public Library in Kokomo, Indiana, this Galentine’s Day and celebrate with a night of indulgence! Get in touch with your romantic side while sipping wine, eating from a magnificent waffle bar, and testing out your artistic skills. Did we mention there is a waffle bar? DeBrand Fine Chocolates has been providing the Fort Wayne area with delectable and deliciously sinful chocolates since 1987. Who says you have to buy a box of chocolates for your significant other this Valentine’s Day? Why not give your besties a mouthwatering box of chocolates to show how much you appreciate them? Choose from the classic collections such as pure fruit creams or PB&J, the truffle collection, or the connoisseur collection which will take their taste buds (and yours) to a whole other level! This is truly chocolate its finest! Take your best gal pals to the Serendipity Martini Bar and let the music take you away! Enjoy live music from local artists and let your inner goddess march to the beat of her own drum. The Arthur Murray Dance Studio provides free instructional lessons beginning at 9 p.m.! And as you dance, be sure to sip from the bar’s finest selection of martinis and cocktails. Come to the Indiana Historical Society and help them celebrate the best day of the year, and their first Galentine’s Day event. Drink to your heart’s content with their mimosa bar, munch on some tasty treats from their brunch buffet, and end with a wine tasting! Here you and your best gals can discover some of Indiana’s very own best gal pals and create your own heartwarming cards to give to each other. Celebrate Galentine’s Day at The Lemon Bar in Zionsville, Indiana and learn how to decorate three jumbo cupcakes from The Flying Cupcake while drinking specially made cocktails or mocktails. Follow Chef Laney’s lead as she teaches you to unleash your inner ‘Cake Boss’ while creating your very own delicious and edible valentine. Cupcakes and wine…what could be better? Come to Painting With a Twist for an awesome girl’s night out this Galentine’s Day and unleash your inner artist! $3 off all bottles of wine, and a class for just you and your best gal pals. Be sure to add some of their delicious snacks with your favorite bottle of wine! Bring your own food, drinks, and BFFs to Kiln Creations in Noblesville this Galentine’s Day and unleash your inner pottery or mosaic lover. Choose your own piece to create and let your imagination run wild! Eat chocolate, drink wine, and tone those areas that we women struggle with so much: hips, thighs, buns, abs, and arms. 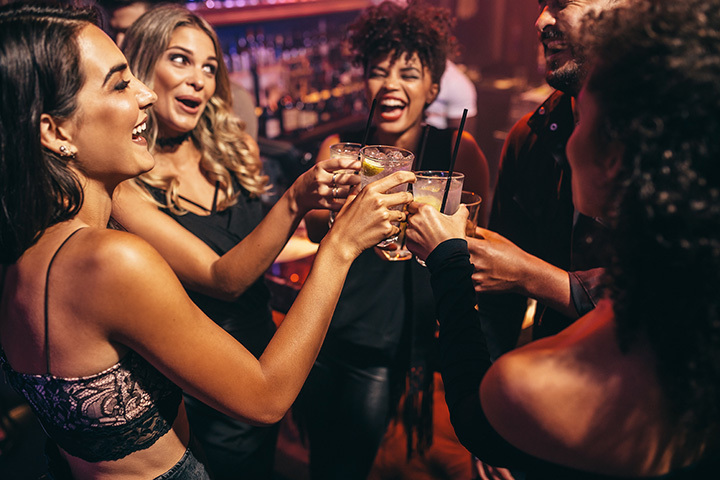 You won’t have to worry about feeling guilty when you head to Air Tan’s Galentine’s Day celebration this year. Get a great tan and leave feeling hydrated, glowing and refreshed. Even better? Five percent of all proceeds will go to the IU Simon Cancer Center to support cancer research! Come celebrate this special day at Four Day Ray Brewing in southern Fishers, Indiana. Expect beers or Bloody Marys, an Elisabeth Strunk watercolor class in which you can create your very own V-Day or G-Day card, a breakfast ice cream sandwich bar, as well as other yummy goodies such as Chicken and biscuits, ham & cheese biscuit, and mini chorizo quiche! In celebrating Galentine’s Day, let’s not forget to contribute to charity on this great night! Bring in the flyer from the Gal’s Guide website between 4 p.m. and close to Puccini’s in Fisher and receive 20 percent off your bill. Take a night off from cooking and enjoy pizza and pasta with some personality!